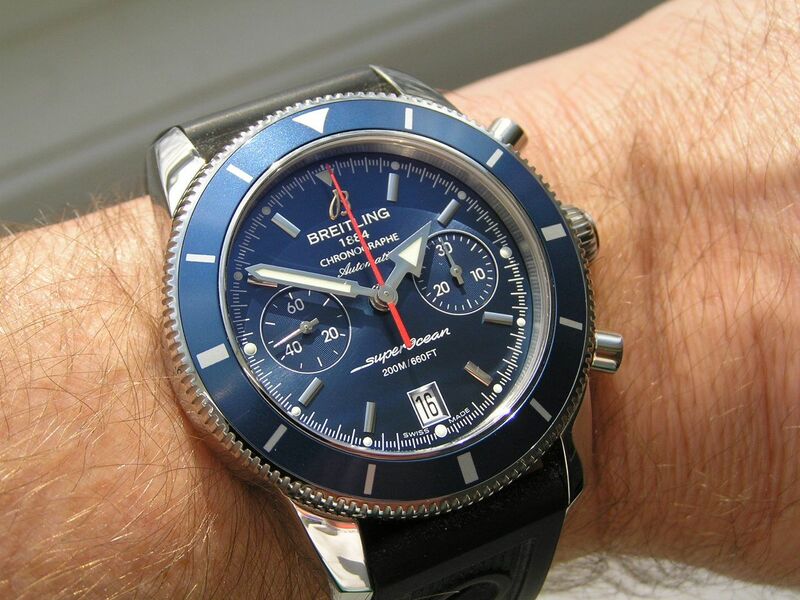 I will begin this review with a simple statement of fact: I really like Breitling watches. 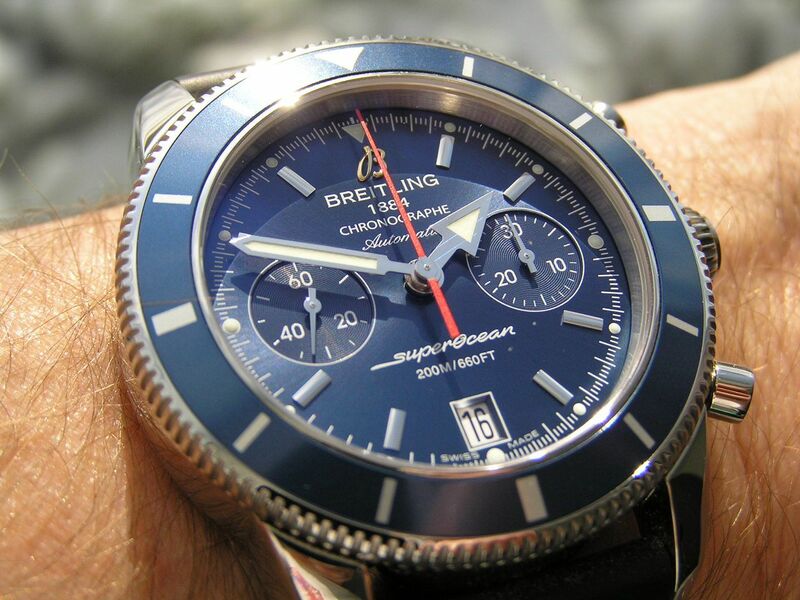 While their designs as of late (including the watch reviewed here) may not seem like ‘traditional’ Breitling designs, mainly due to the lack of their fabled rider tabs on the bezel, the company is producing some superb models and this Superocean Héritage Chrongraphe is no exception. The Héritage Chronographe series comes in both 44mm and 46mm sizes, the later having three subdials for the chrono, with the 44mm models being the two-register chronographs. I was smitten when this blue 44mm Héritage Chronographe went on sale and I have not regretted my decision to purchase it one bit. 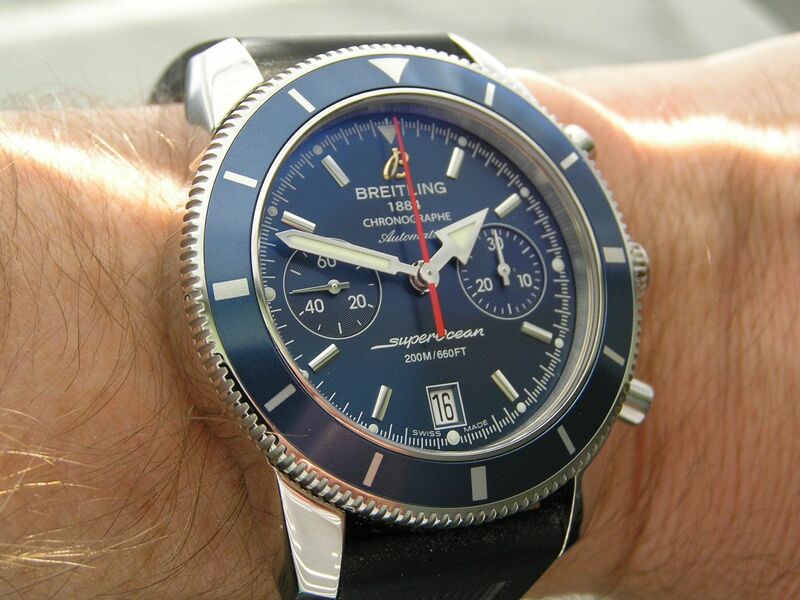 The 44 model is available in several colors, including black dials with black, green or red gold bezels in addition to the blue dial/blue bezel reviewed here. 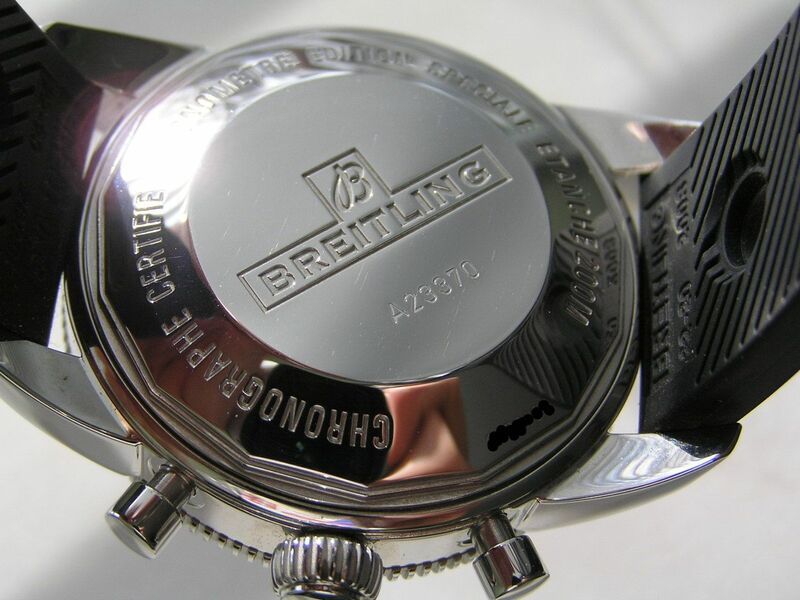 The case is fully polished to a mirror shine, something that Breitling seems to excel at. The finish is exquisite. The case is all stainless steel, measuring 43.5mm across the width of the bezel, the actual case size is a tad smaller due to the overhang of the bezel. With the signed, screwdown, semi-onion style crown included in the case measurement, the size comes in at 47.6mm. 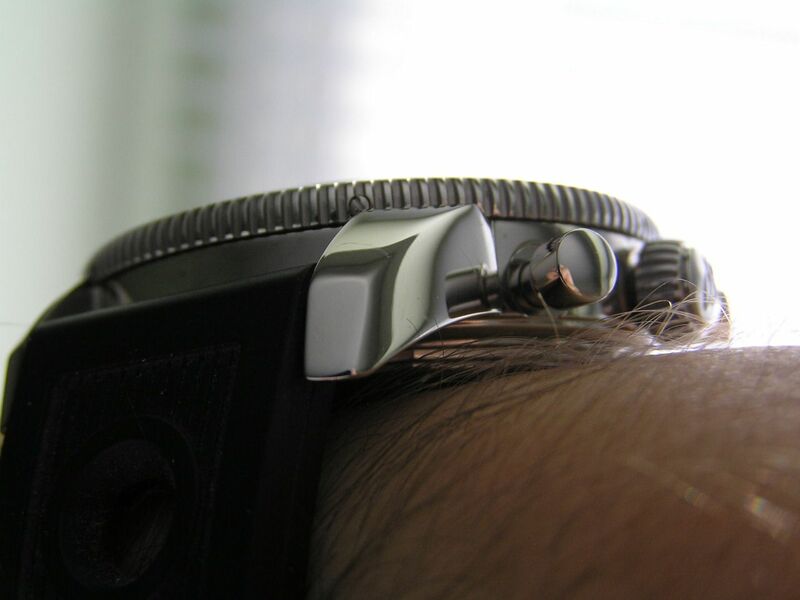 Yes, this is a large watch, but please don’t be scared off, it doesn’t wear large, partly due to the shorter lugs that are downturned towards the wrist. Lug-tip-to lug-tip measures 52.9mm, case thickness is 16.1mm and lug spacing is 22mm. The crown has a great feel to it and is easy to use, screwing down with about three full turns. The crown features double gaskets for superior water resistance. 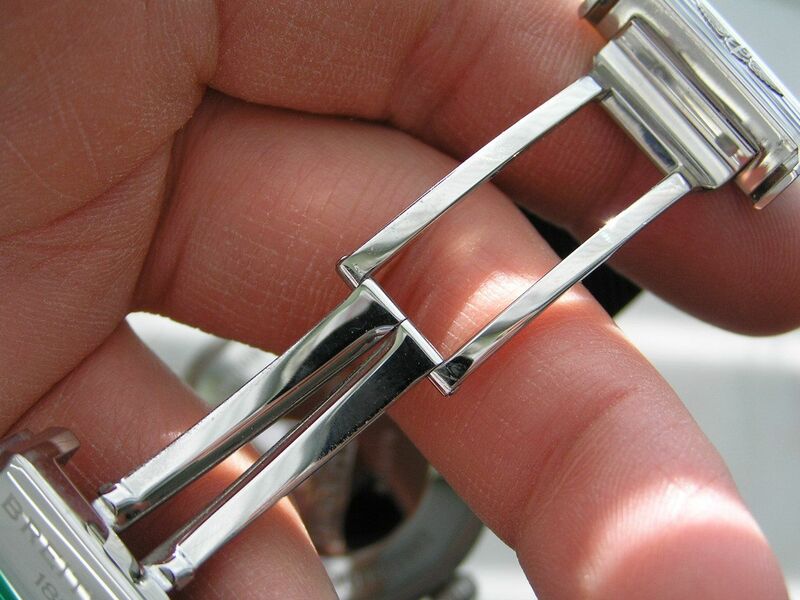 The caseback is screwed down and is fully polished like the rest of the case. 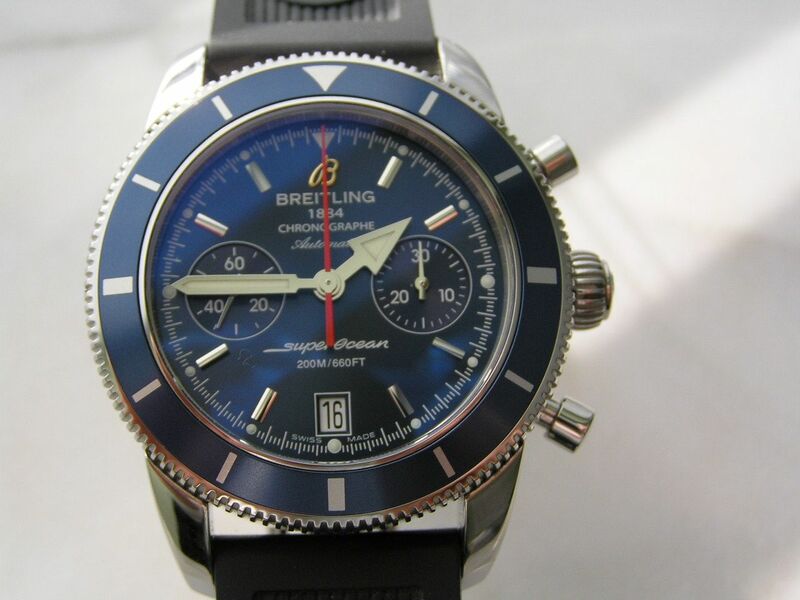 It carries a stamped signature of Breitling and the company’s logo, along with miscellaneous wording about the watch. The chronograph pushers are fully polished as well and are simple, no-nonsense buttons that complement the design of the watch perfectly. 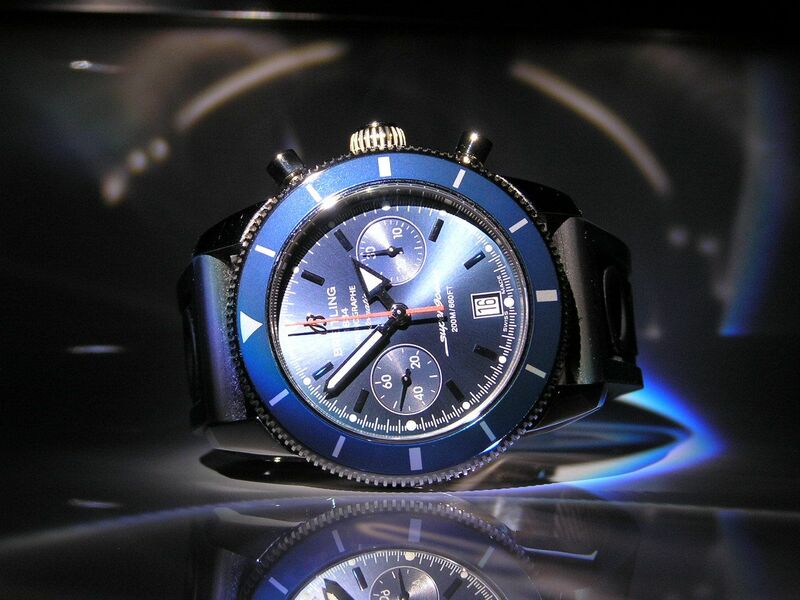 The Héritage Chrongraphe 44 is factory rated at 200 meters of water resistance. 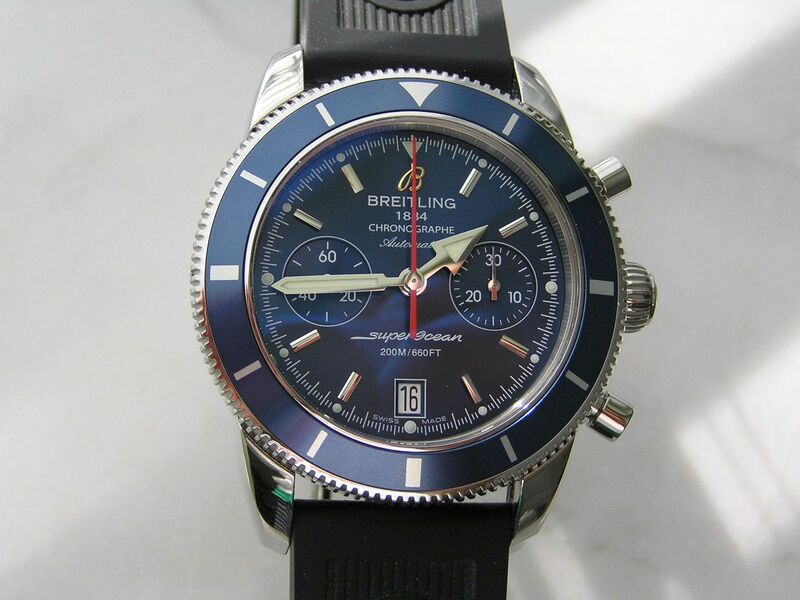 It’s always nice to own a chrono that can take some depth, just don’t operate the pushers when under water. Build quality is what you would expect of a watch of this caliber. 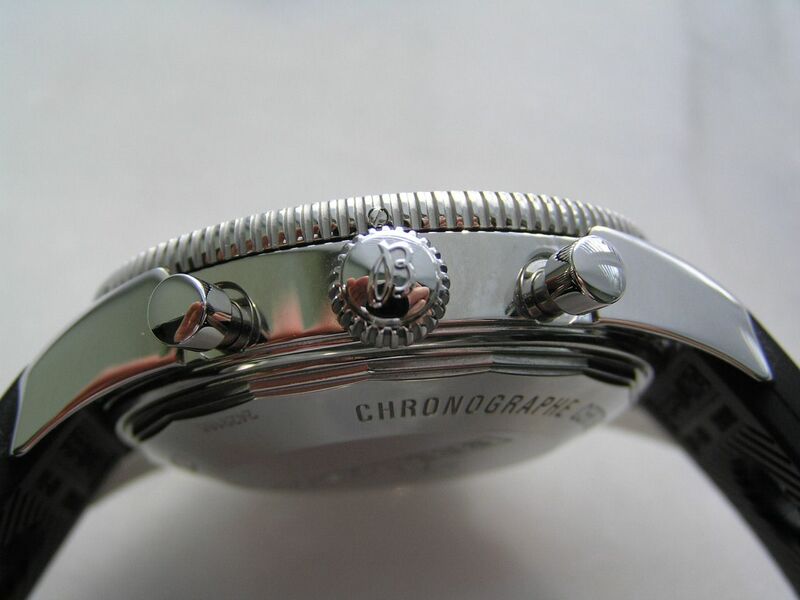 The polished finish is amazing, the dial is clean, the hands align perfectly and the insides of the lugs and case sides between the lugs are fully finished, which is an area many watchmakers overlook. Nicely done! This model is quite hefty and rather thick, and being on the rubber strap can make it a bit top-heavy at times, but not overly so. If you like some mass to your watches, the Héritage Chrongraphe 44 is certainly a watch to consider, but don’t let this fact scare you off, either. The watch does wear very well most of the time and looks great all of the time. The overall look of this watch is what captives me so. 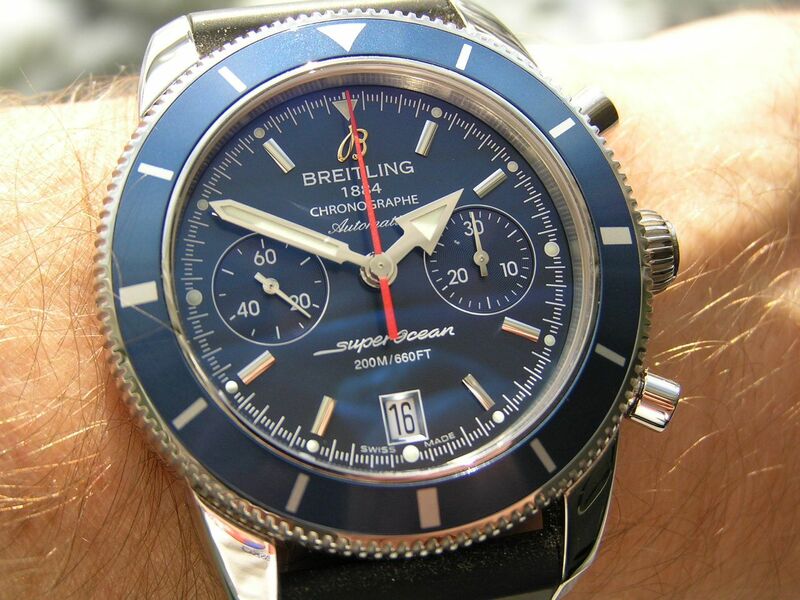 The shade of blue used for the dial and bezel (‘gun blue’ according to Breitling) is absolutely perfect. It’s a great shade, not too dark, not too light, it’s really for lack of a better word, perfect. 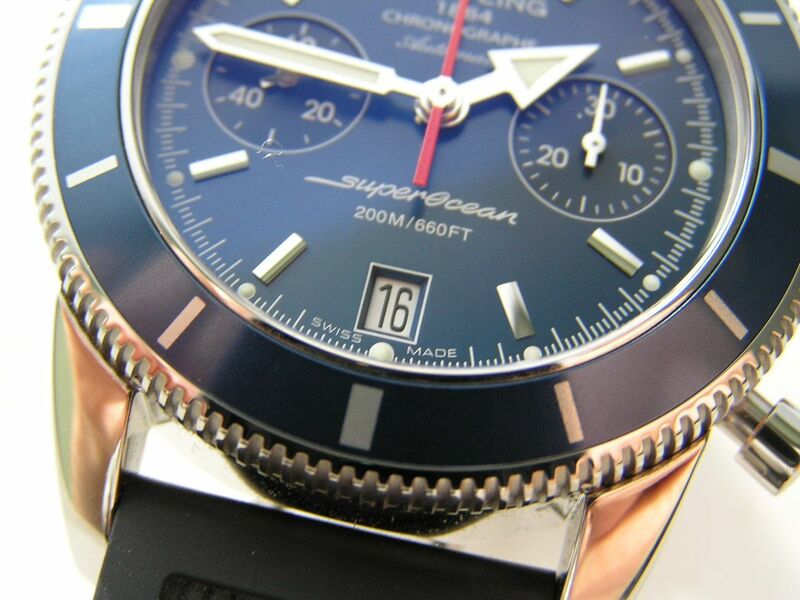 The dial has applied silver rectangular markers and a beautiful, yet subtle, gold Breitling ‘B’ at the 12 position. The hands are substantial, silver with inset lume. The hour hand is a nifty arrow type and the minute hand is a stick type with a pointed end. 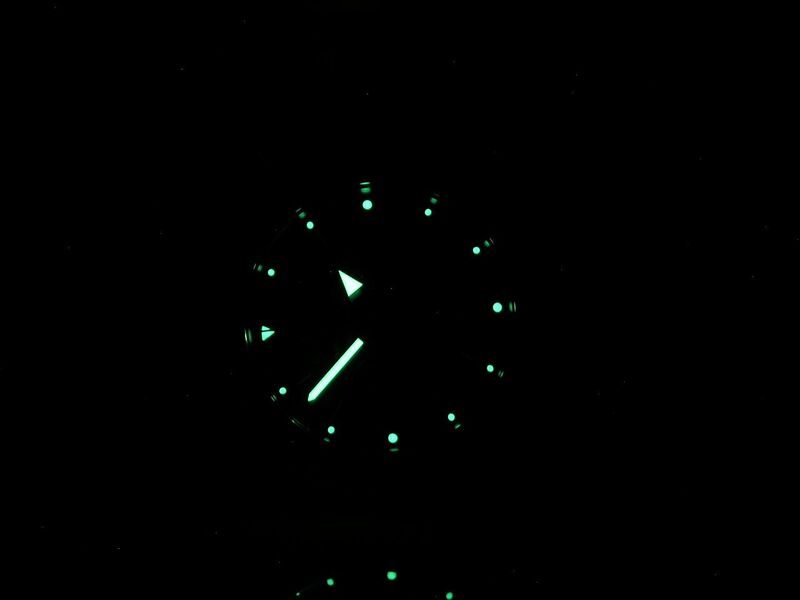 There are small lume dots on the outer edge of the markers and a small inverted triangle of lume at the 12 position. The hour and minute hands are the only other lumed pieces on the dial. Lume quality is very good; it’s strong, bright and greenish-white in color. The subdial at 9 is the watch seconds hand and the subdial at 3 is the 30-minute chrono totalizer. Both subdials have a circular pattern to them with white printing and simple silver hands. The red center seconds hand is the chrono seconds hand. A simple white printed chapter ring encircles the dial, with hash marks for each second or minute. There is quite a bit of printing on the dial, something which I am not usually a fan of. The printing on this watch is small enough so as not to distract from reading the dial, but it still is a bit excessive. Under the gold ‘B’ is the ‘Breitling’ script; below that is ‘1884’, then ‘Chronographe’, then a script ‘Automatic.’ But wait, we’re not done yet. 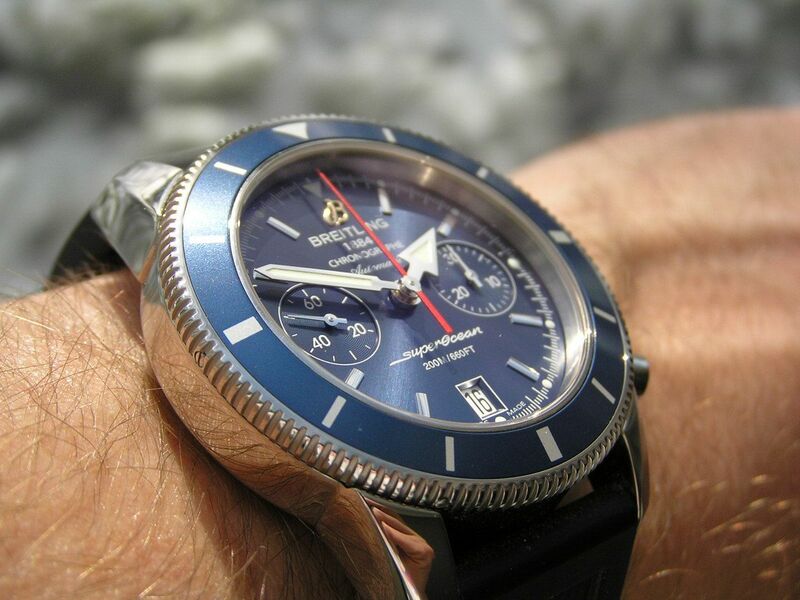 Above the six position on the dial is ‘SuperOcean’ and ‘200M/660FT’. Like I said, a lot of printing, all of it in white. The date window is at the 6 position, a black on white date wheel, with the window outlined in white. 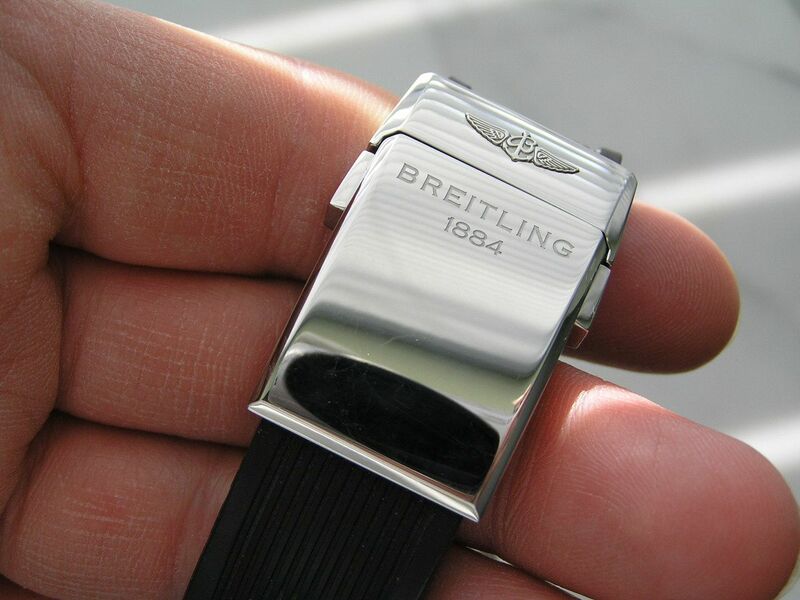 The date function is non-quickset, as Breitling deleted this feature when they modified the base movement of the watch. So in order to set the date, you have to do the moving of the hands past midnight, then back past 8pm, then past midnight dance until the date is set correctly. This is fairly inconvenient for some, especially for a watch in this price category. This is really pretty much my only gripe with this watch. Luckily, the crown is a nice size and has suitable knurls on it to make it easy to operate and use. The bezel is a 120-click unidirectional type that is a model of simplicity. There is no lume on the bezel and just plain rectangular markers every five minutes. 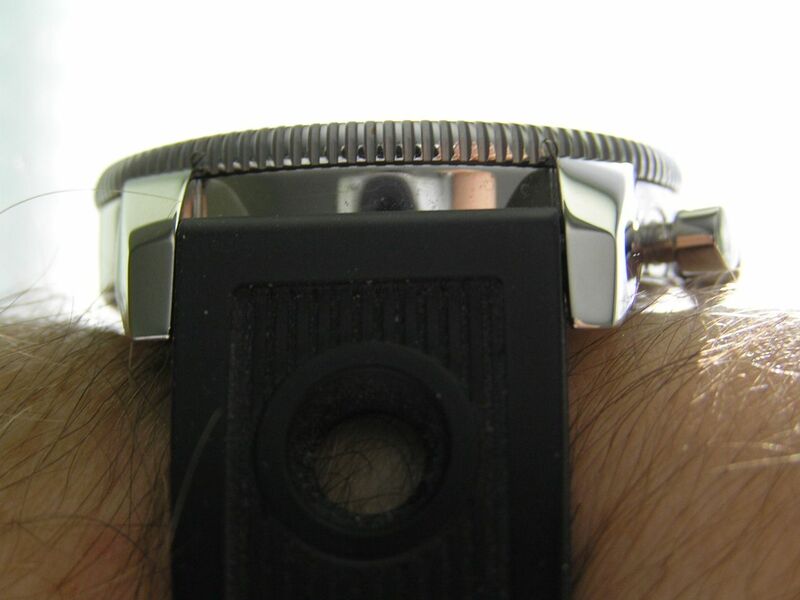 The bezel has a coin-edge and is secured by small screws that are barely visible from the side. The bezel clicks with a good sound and there really is no backlash. The dial is capped by a very slightly domed sapphire crystal with anti-reflective coating on both sides. 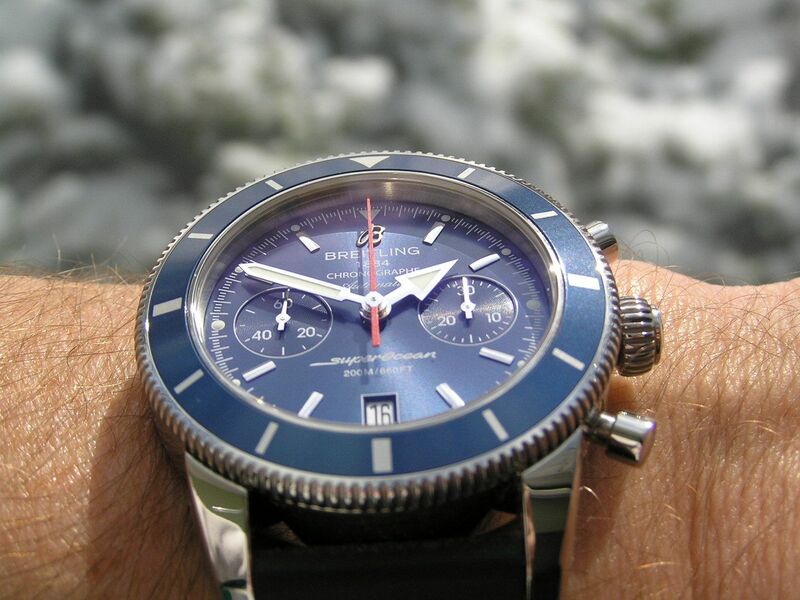 All told, the Héritage Chronographe 44 is a beautiful watch to look at and is also very legible at the same time. Inside the Héritage Chronographe is Breitling’s Caliber 23 automatic chronograph movement, which starts life as a Valjoux 7753 before Breitling modifies it and tweaks it to their specifications. The movement beats at 28,800 bph and moves in 25 jewels. It hacks and manually winds, but as mentioned previously, the date is not quickset. 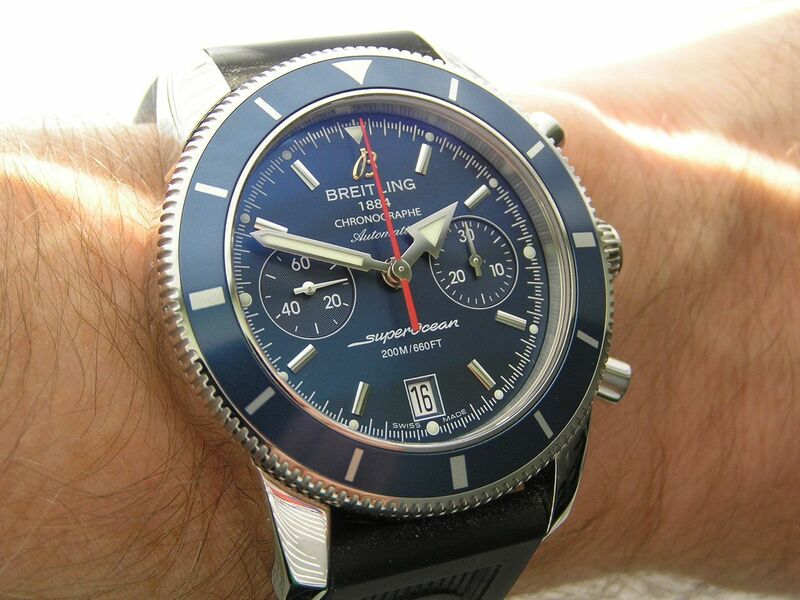 As with all Breitling watches, the Caliber 23 is COSC certified and during my testing, it has run just inside of the COSC maximum at about +4 to +6 seconds per day. Power reserve is an ample 52-1/4 hours and the watch has been easy to set and use, with all the chronograph functions starting, stopping and resetting perfectly. The Héritage Chronographe can be had on leather, rubber or stainless steel mesh and it looks great on any of these options. While I am not a big fan of rubber straps (although I have relented recently to some degree), the rubber ‘Ocean Racer’ strap not only looks cool with its retro rally holes, but is soft, comfortable and thankfully NOT scented. It looks ideal on this watch and I am really enjoying it. 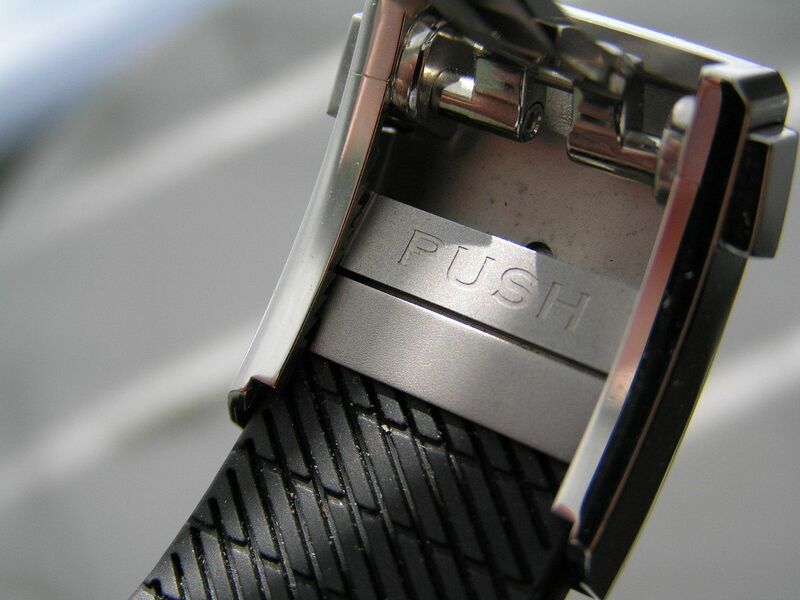 The strap is thick black rubber, measuring 22mm at the lugs and tapering to 20mm at the fully polished pushbutton clasp with polished machined deployant. If you are going to do a rubber strap, this clasp is the way to go. The clasp is signed and has a substantial look and feel to it. 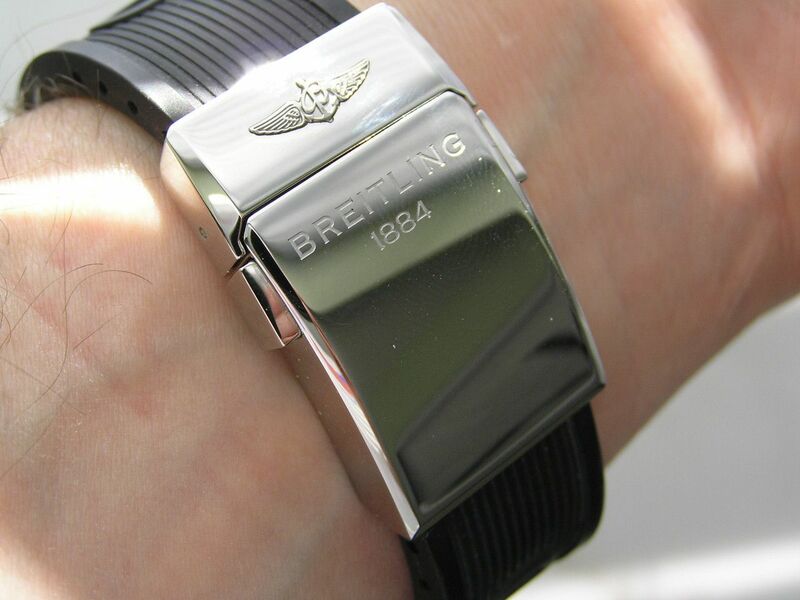 You still have to trim the rubber strap to your wrist size, but Breitling has included a hidden pushbutton micro-adjustment (see photo) on the underside of the clasp to fine-tune fitment. It works and works well. Presentation is nice, but certainly not over the top. A heavy plastic-type outer two-piece box opens to reveal the signed padded watch carrier that holds the watch and can double as a travel box if needed. A yellow cardboard envelope holds the COSC certification, warranty card and instruction manual. 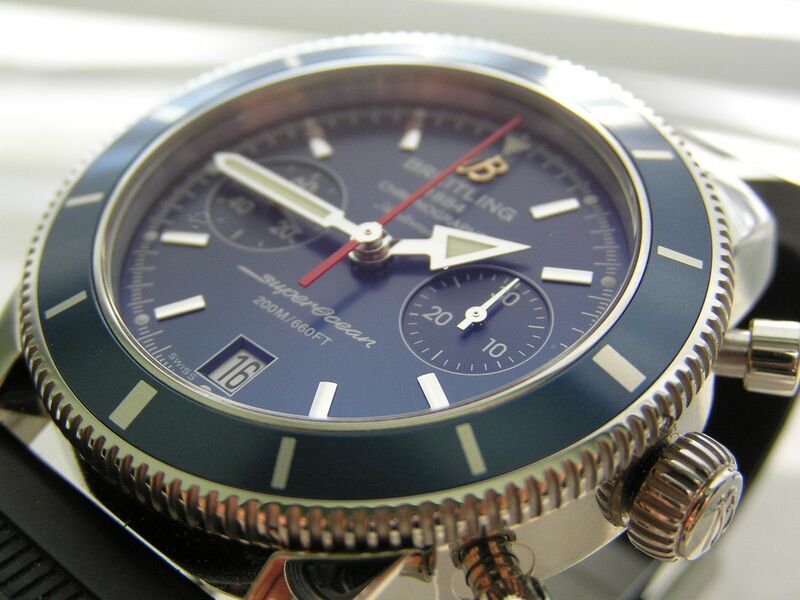 Breitling really did a great job with the Héritage Chronographe 44. 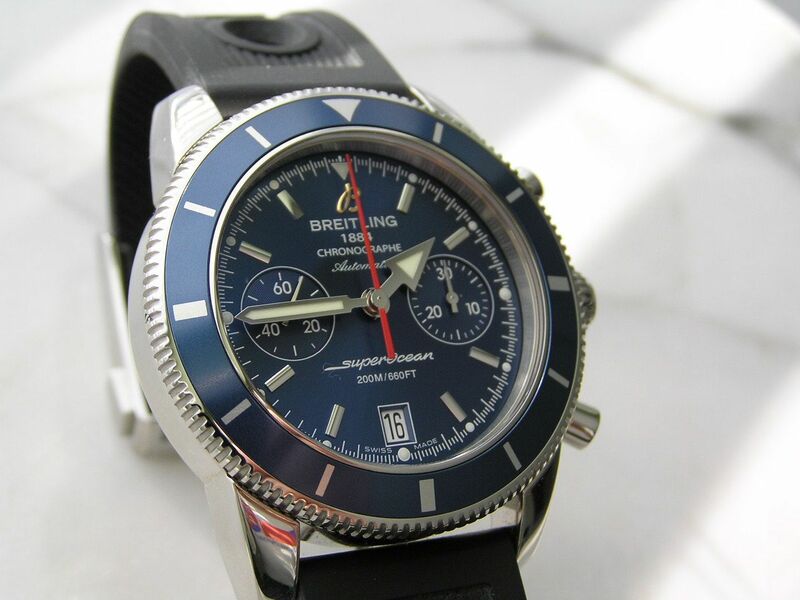 The watch wears well, looks stunning and still does a good job carrying on Breitling’s long Swiss tradition of quality watchmaking with unique style and features. A total winner! Verdict: almost perfect, the Héritage Chronographe 44 has it all; great looks, great functionality and top quality. You can’t go wrong with this watch, it’s a real gem! Great review! Very spot on.